Perfect thumb dressing forceps for removing surgical dressings, or other highly detailed work requiring a precision Lab Tweezer. Quality Control: Each lot of Copper TEM Grid Tweezer was tested successfully. 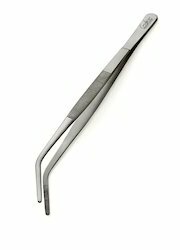 Tweezers are dental instruments used to place small objects in the mouth and retrieve small objects from the mouth. These tweezers come in either locking or nonlocking types; the locking type has sides that lock together to prevent materials from being dropped. So as to uphold the standing we have built up, we are engrossed in presenting a broad compilation of Copper Tweezer. tweezers made of steel but heat resistant plastic-covered tips for firm grip. Use for holding pieces while cleaning. - Each cartridge is individually controlled by the microprocessor located inside the control unit, ensuring fast heat-up, accuracy and recovery. - The range of cartridges available allows desoldering of the smallest sized components. Also available in grooved tips according to requirement (in medium & thick point only). Diamond or gemstone tweezers are used for a variety of task. Use when grading stones, making jewelry, setting stones, designing jewelry, repairing watches and more. They are lightweight and are comfortable to hold while using them. We are instrumental in offering an enticing assortment of Tweezers Sets that is manufactured employing high quality material, sourced form best vendors. 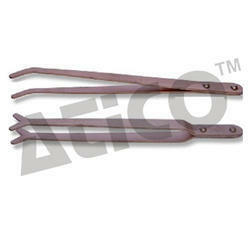 We put forth a varied range of Tweezers that is manufactured from optimum quality material such as stainless steel. It is precisely designed in different shapes & sizes for easy handling and optimum performance. This range is resistance to acid, alkaline, heat & corrosion and is offered at very reasonable prices. Plastic Tweezers, General Purpose with Toothed 1x2 Tips. Jeweller and watchmaker Tweezers are available in full range and all nos. Tweezers with epoxy coated colour black.The epoxy tweezers are available in different -different products depending upon customer demand.